Don Benigno Aquino Sr. was born in Murcia, Concepcion, Tarlac to Hen. Servillano “Mianong” Aquino a general of the Philippine Revolution, who later on served as a member of the Malolos Congress and Guadalupe Quiambao. He had two siblings, namely Gonzalo Aquino (born 1893) and Amando Aquino (born 1896). He studied at the Colegie de San Juan de Letran in Manila and later at the University of Santo Tomas where he earned his law degree in 1913. Ha was admitted to the bar the following year. “I can still remember that fateful day in July of 1942 when Lt. Vinzons was paraded around the marketplace. People thronged to hear again that beloved voice. He was pale, unshaven, malaria stricken. He would languidly smile and smile and wave his hands at friends. He was publickly insulted by some Filipinos in a manner reminiscent of the day when our Lord Jesus Christ, on his way to crucifixion was treated in the same way by the Scribes and the Pharisees. Out of the clear sky came trooping to town, Mr. Benigno Aquino, then Secretary of the Interior, in the company of bayonets and some be-ribboned officers of the Japanese Military Administration. There was a public meeting. My province was then the hotbed of resistance against the Japanese and Mr. Aquino had a cure for it. My province, he said, was like a water container with a leaking faucet, it had to be plugged tight. Then, we know, death was in store for Vinzons. There followed a secret conference in the courtroom… Oh, it was a banner day of our political enemies! There i saw a former Assemblyman, former Mayors, influential Filipinos who had previously been made captives by Vinzon’s guerrillas and released. I did hear of a written petition to have Vinzons killed; but in the sad years that followed, I failed to get hold of a original copy of that accursed document. Benigno S. Aquino Sr. was the director general of the The Kapisanan ng Paglilingkod sa Bagong Pilipinas (English: Association for Service to the New Philippines), or KALIBAPI, a political party that served as the sole party of state during the Japanese occupation. It was intended to be a Filipino version of Japan’s governing Taisei Yokusankai party. KALIBAPI was established as a mass movement designed to support the occupation whilst taking advantage of nationalism in the region. Established in December 1942, the party was headed by its Director-General Benigno S. Aquino with Pio Duran as Secretary-General and effective second in command and Ganap leader Benigno Ramos as a member of the executive committee.] The three toured the Philippines, setting up local party organizations and promoting the “new order in East Asia” at mass meetings. For the Japanese, KALIBAPI served as a labor recruitment service in its initial stages before taking on an expanded role in mid-1943. It was left to KALIBAPI to write the new constitution and establish the new National Assembly, resulting in Aquino’s appointment as Speaker (as his replacement as Director-General by Camilo Osías). All 54 members of the Assembly were KALIBAPI members, although 33 of them had held elected office before the invasion as well. KALIBAPI soon claimed a membership that ran into the hundreds of thousands. The islands were declared officially independent as the Second Philippine Republic on 14 October 1943 under the Presidency of José P. Laurel and his KALIBAPI government. This had been accomplished through the Preparatory Committee for Philippine Independence, which KALIBAPI had established in mid-1943 under Japanese direction. Benigno Ramos, the former Ganap Party leader, and Partymate of Aquino formed the Makapili, in November 1944 to give more tangible military support to the Japanese. On December 1944, as the combined Filipino and American forces continued their advance to liberate the Philippines from Japanese forces, the government of the Second Philippine Republic was moved to Baguio which included Aquino before they flew to Japan where together with other officials, they were arrested and imprisoned at the Sugamo Prison when the Japanese surrendered. 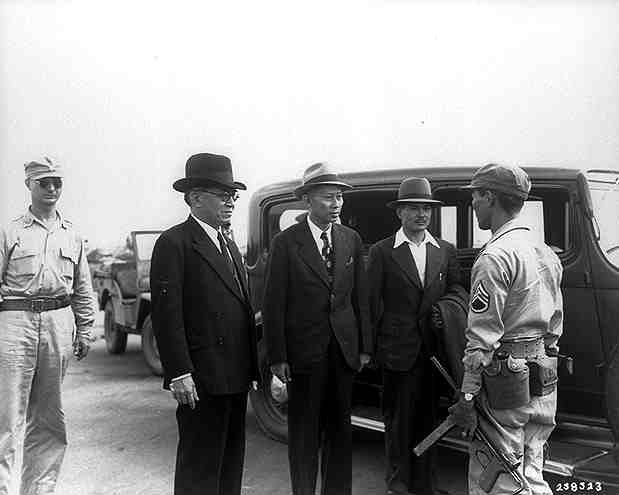 Benigno Aquino, Sr. (center) being taken into U.S. custody at Osaka Airport in 1945, along with Jose P. Laurel (left) and José Laurel III (right). On August 25, 1946, Aquino was flown back to the Philippines for his trial on treason charges by the People’s Court, a few weeks later he was released on bail. KALIBAPI disappeared after the Japanese surrender with some of its leaders arrested for collaboration and treason. No former KALIBAPI candidates ran for office in the 1946 general election, and some of those not arrested went into hiding in the Philippines, as exile in Japan, or were executed by vengeful Filipinos or by the Communist-aligned Hukbalahap Party members. On December 20, 1947 he died of a heart attack at the Rizal Memorial Coliseum in Manila while watching a boxing match.